by Jose Antonio PhD. “Watchin’ the game, havin’ a Bud.” One of my favorite commercials of all time is the Budweiser Original Whassup Commercial. Every time I see the acronym ‘SUP,’ it reminds me of that commercial. For old time’s sake, check it out! WhasSUP is SUP! 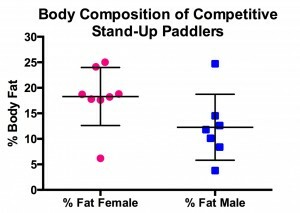 Did you know that guys and girls who regularly train by doing stand-up paddling are overall, pretty darn lean. Yep, you read that right. One morning as a was sipping on my 2nd cup of caffeine-filled coffee (anyone who drinks decaf is as un-American as the ‘hammer and sickle”), I decided to massage a few numbers to see what the “typical” body composition was of seven male and eight female competitive SUP athletes that my research team at Nova Southeastern University have had the privilege of testing. Check out the figure below with pink circles and blue squares. It may look sciencey and all, but it’s actually fairly simple. If you stayed awake in your college statistics class, you’ll decipher that data faster than you can shake a Polaroid picture. So what’s the scoop? First of all, each pink circle or blue square represents an individual female or male SUP athlete’s percent body fat. If you look at the y or vertical axis, you’ll see the scale starting from 0% fat (which only exists on the X-Files) going up to 30% fat (which you’ll find is on the high end in female athletes in general). On average, female SUP athletes are about 18.3% body fat. Male SUP athletes are about 12.3% body fat. These percent body fats were obtained via air displacement plethysmography (aka the Bod Pod). One should note that the Bod Pod often overestimates % body fat in lean individuals. But what the Bod Pod is very good at is determining whether body composition changes (i.e., changes in fat mass and/or fat-free mass). Nonetheless, averages only tell part of the story. You’ll also notice in the figure that there is quite a ‘spread’ of the data (i.e., standard deviation). 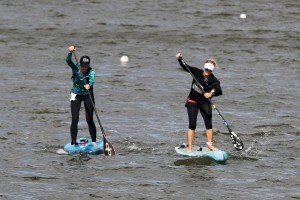 You even have male and female SUP athletes in the single digits. Holy low-body-fat Batman! That’s like leaving a tooth under your pillow and finding a gold nugget the next day. Ok, maybe not. But it’s pretty intriguing. Obviously there are the lucky few who hit the genetic lottery and train like maniacs. It is extremely difficult for any athlete to hit the single digits and stay there. It’s as rare as seeing Bigfoot at Yellowstone National Park. 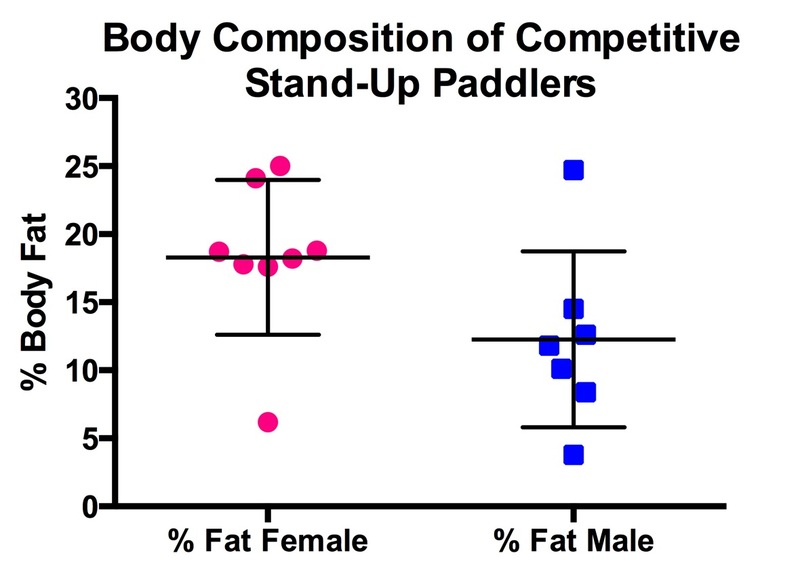 On the flip side, you also have male and female SUP athletes exceeding 20% body fat. If you compare that to the average SUP’er it does seem ‘high.’ But in reality it falls within the range of where college athletes are. Let’s now go to figures below (red bar graph and blue bar graph). 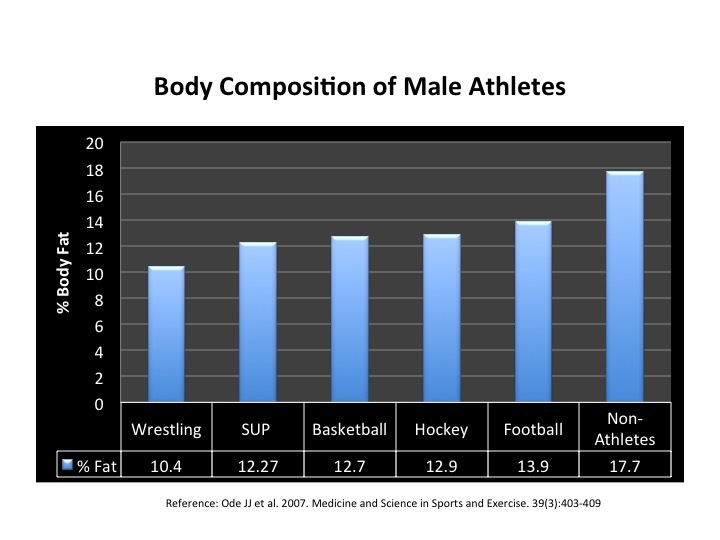 I decided to look up some of the published scientific data on body composition in male and female college athletes. Keep in mind that the SUP athletes I’ve measured are typically older (> 30 years of age). 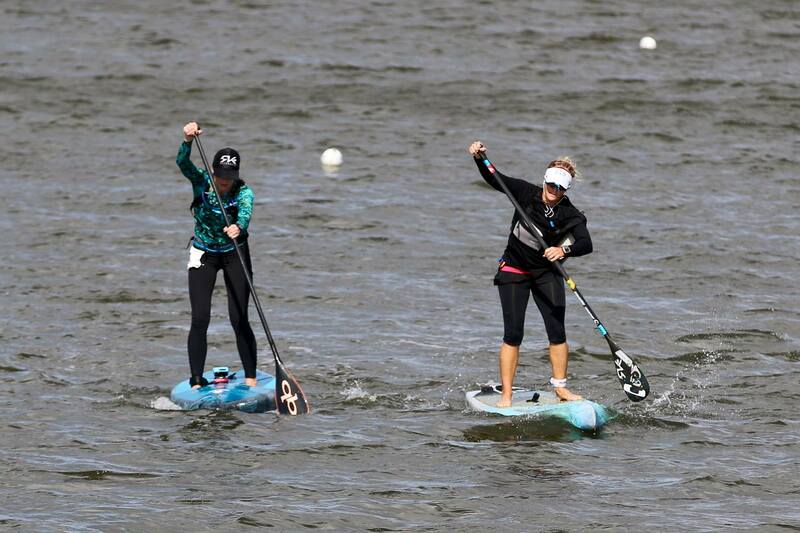 And yet, at least for female SUP’ers, they are leaner than college-age basketball, softball and crew athletes. And for the guys, they are as lean as athletes in traditional sports like football, hockey and basketball. So clearly, all you young (and old) SUP’ers have a good thing going. 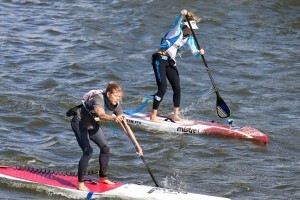 SUP is a sport that can be best described as a ‘power-endurance’ sport. It also requires a high aerobic capacity as exemplified by the fairly high V02max data I’ve collected. However, you also need to generate power over many many miles. So it’s a bit of a ‘hybrid’ in the sense that it is not a pure ‘cardiovascular’ sport (i.e., it is not all about cardiac output). Instead, you still need to develop a high level of skeletal muscle power/endurance. So before your eyes start to roll back because you’ve seen more data in this article than that dreaded stats or math class, I want to leave you a few key pieces of advice that SUP’ers and all athletes should follow if they want to perform better. Haphazard training produces haphazard results. Have a plan. Stick to it. Train in a systematic fashion. Stay tuned for some super-cool data on training. What’s the correct mix of volume training versus HIIT? Dial in your nutrition. This is perhaps more difficult than training. Get plenty of protein and fat (the two most important macronutrients) and sufficient carbohydrate. There’s no need to ever ‘carb-load’ in this sport. (Nutrition can be its own article; maybe when my brain is more caffeinated, I’ll write that one). Body composition is just one aspect out of many that are important for optimal performance. In general, having a certain amount of lean body mass is important for excelling at SUP. Even if you’ve been dealt the not-so-good end of the genetic lottery, you can still improve. It just depends how badly you want it. Geek Reading That You’ll Probably Never Read – Unless at Gunpoint – JJ Ode et al. Body Mass Index as a Predictor of Percent Fat in College Athletes and NonAthletes. Medicine and Science in Sports and Exercise. 39(3):403-409, 2007. About the author: Jose Antonio earned his PhD at the University of Texas Southwestern Medical Center. He is a professor at Nova Southeastern University in Davie FL and the CEO of the International Society of Sports Nutrition. He enjoys junk food as much as the fat kids at the Texas State Fair. He’s been doing research on sports nutrition and human performance for nearly 3 decades. Somehow he’s managed to publish a dozen books and more scientific papers than there are states in the Union. And that’s between beach time and watching sports. 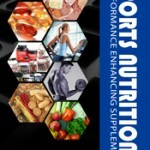 Check out the International Society of Sports Nutrition’s conferences. There are more super-cool geeks (now that’s oxymoronic) here than there are Chins in a Chinese phonebook. 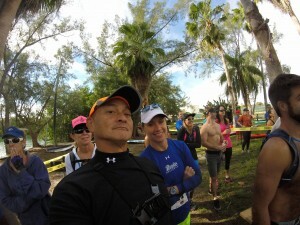 This entry was posted in Articles, Fitness, ISSN and tagged paddle, paddling, SUP on February 14, 2016 by Jose Antonio.